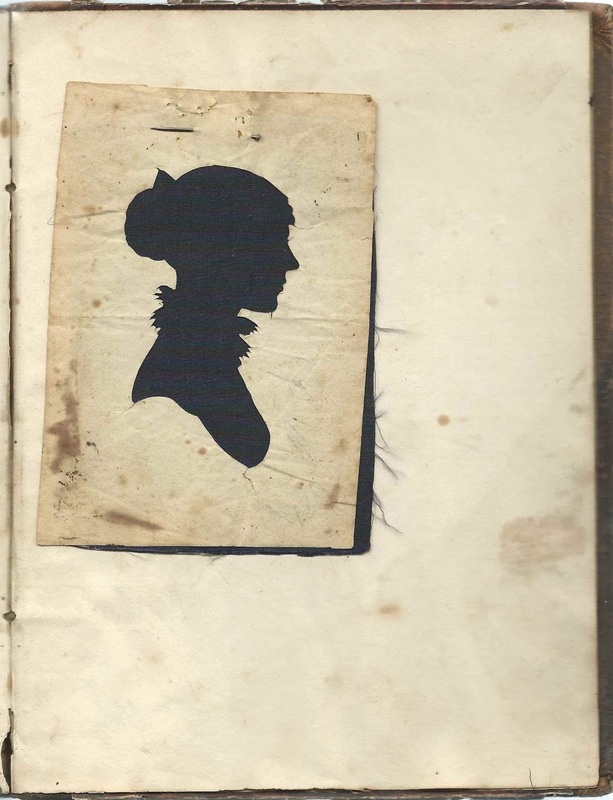 1835-1841 autograph album that belonged to Louisa Jedidah Porter of Vernon, Connecticut. 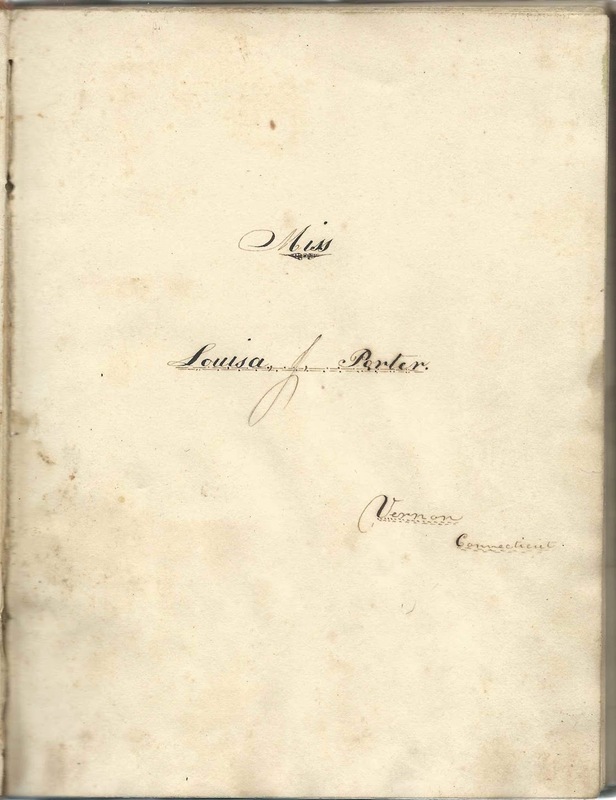 Her name is stamped on the front cover, and it was presumably Louisa who wrote her name on the first end paper. Louisa added notes to many of the pages, including the future married names of female signers; a few death dates; residences. 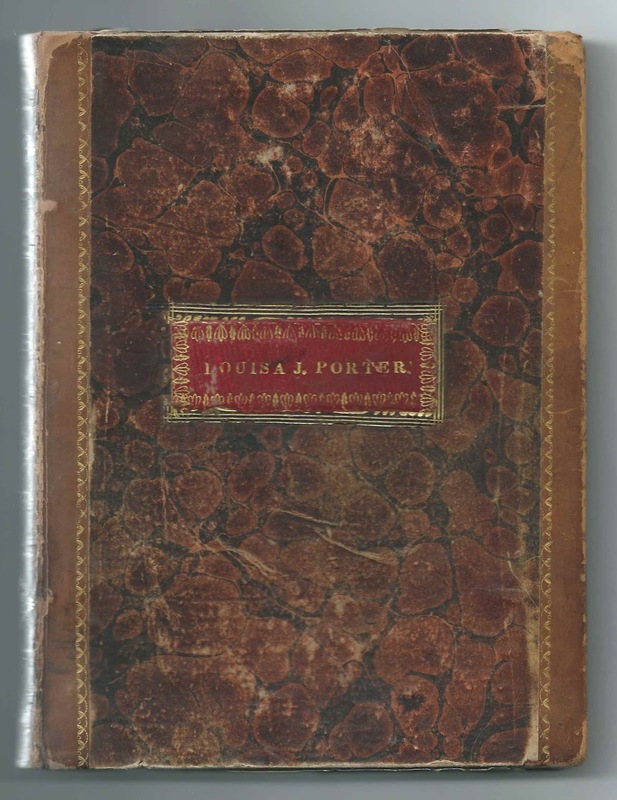 The album, published by David Felt of New York and Boston, measures approximately 7-3/4" by 6" and contains the sentiments of nearly 80 of Louisa's friends and, possibly, relatives. An alphabetical surname list and an alphabetical list of the signers, together with any personal information they offered, appear at the end of this post. 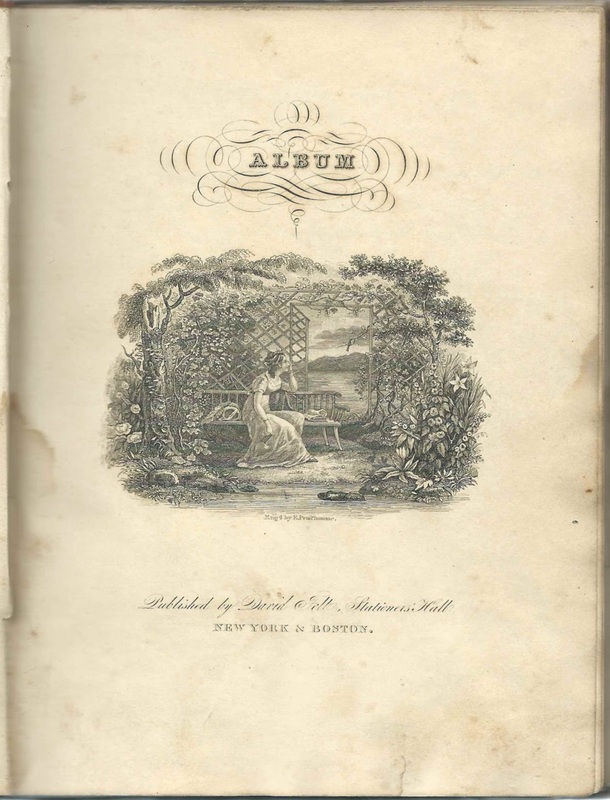 The album also contains an engraving on the title page and two hand-colored floral illustrations within. Louisa Jedidah Porter was born February 5, 1817, at Coventry, Connecticut, the daughter of Abner and Elizabeth (Baker) Porter. Louisa's middle name came from her paternal grandmother Jedidah (Cubbusch) Porter. There's a silhouette pinned to the back end paper. Could it be Louisa Jedidah Porter? On 30 April 1843, Louisa married John Harmon Martin, son of Elisha and Almira (Robbins) Martin. Louisa and John had a daughter, Louisa Alice Porter Martin, born December 19, 1848 at Vernon, Connecticut. Sadly, John Harmon Martin died a few days before his daughter's birth, and his widow, Louisa Jedidah (Porter) Martin, died soon after, on January 19, 1849. The 1850 Census shows daughter Louisa Alice Porter Martin living in the household of John and Leisa Robertson of South Windsor, Connecticut. Louisa Alice survived to adulthood and married English native Frederick Norton Smith; they moved to California. One signer added a colored paper-cut design to the page. She was Mary Griswold, who inscribed a page at Broad Brook, Connecticut, on March 12, 1837. Another page was inscribed by W. W. Eaton at Tolland, Connecticut, on March 17, 1835 may have been future Connecticut senator William Wallace Eaton. Eliza Ann ?, signed on May 9, 1835. Later note: "Now Mrs. ? [possibly Billz or Billy and may refer to the husband's given name/nickname rather than surname]. W. H. T. or W. H. ?
? Fay; not sure of name. Later note: "Monson, Mass". D. O. or D. C.. Later note: "Vernon"
H. Bosworth or K. Bosworth, signed at Vernon, Connecticut in March 1835. Later note: "Now Mrs. McCallum". Presumably Harriet Bosworth and Erastus McCollum; they married April 12, 1838. Erastus' first wife Lydia Corning died in 1837. E. R. Champin, signed on November 6, 1835. Later note: "Vernon", meaning Vernon, Connecticut. M. F. Chapman, signed at Tolland, Connecticut, on December 30, 1837. Later note: "Died February 1845". Presumably Minerva F. Chapman, who died February 4, 1845 and is buried at the North Cemetery at Tolland, Connecticut. L. Chapman. Later notes: "Tolland, Conn."; "January 4, 1838"
J. Chase, signed at Vernon, Connecticut, in March 1840. If a woman, perhaps Joanna Chase who married Alphonso C. Crosby. William Cogswell, signed at Vernon, Connecticut, on March 25, 1840. Middle initial might be T. If so, he might have been William Thompson Cogswell. A. C. Crosby, signed at Broad Brook, on March 27, 1836. Perhaps Alphonso C. Crosby who married Joanna Chase. Julia A. ?, signed at Vernon, Connecticut, on October 9, 1835. Later note: "Now Mrs. Chapman". Possibly the Julia Ann Dimmick/Dimmock/Dimock who married Daniel Chapman on September 28, 1837. Almira. Later note: "G. Dimmick". Louisa identified her as Almira G. Dimmock. Almira Gurley Dimmick/Dimick also inscribed the right facing page. Almira G. Dimmock, signed at Vernon, Connecticut, on February 14, 1836. Later note: "Now Mrs. Holt" . Almira Gurley Dimmock married Austin Holt at Vernon, Connecticut, on March 26, 1838. Almira also inscribed the left facing page. W. W. Eaton, signed at Tolland, Connecticut, on March 17, 1835. Presumably William Wallace Eaton (1816-1898); US Representative and Senator from Connecticut. S. Goodell, signed at Ellington, Connecticut, on January 31, 1836. Later note: "Mrs. Lathrop Pease [?]" There was a Sally Goodell who married Lotrop Pease on April 1, 1841; his name appears also as Lathrop Pease. Mary Griswold, signed at Broad Brook, Connecticut on March 12, 1837. She affixed a cut-out pattern of birds and sketched other birds. Emeline Heath. Later note: "Now Mrs. Buckminster". Connecticut record of marriage of Emeline Heath and David M. Buckminster on March 27, 1839 at Mansfield, Connecticut. Lovina or ? Herick or Herrick, signed at Vernon, Connecticut, in 1836. Later note: "Now Mrs. Ryder"
H. W. Hinkley. Later notes: "Vernon" and "Now Mrs. Tuttle, New London". Presumably Hannah W. Hinkley, who married Elizur C. Tuttle on May 17, 1843. E. K. Hinkley; middle initial could be H.
R, signed at Vernon, Connecticut, on October 23, 1835. Later note: "Johns", meaning that her name was R. Johns. "Now Mrs. Holmes". Possibly Rosannah Johns who married Gilbert Holmes on December 31, 1840. Presumably the Rosannah Johns who signed the right facing page. Lucy Ann Joslyn, signed at Vernon, Connecticut, on March 13, 1836. Not sure of name except for Ann. Given name could be Lovy or Susy or ? Later notes: "Now Mrs. ___". A space below "Mrs. B." Name looks like Berkshire or similar. Might not be Mrs. Bx - might be a town. 2-page sentiment of E. W. Kellogg, inscribed at Vernon, Connecticut, in December 1836. Warren Lumbard, signed at Vermon, Connecticut, on February 21, 1836. Later note: "Died at Munson, March 1837" Possibly the Warren Lumbard (1805-1837) of Brimfield, Massachusetts, who died March 26, 1837. Lydia C. Lumbard, signed at Monson, Massachusetts, on February 21, 1836. Later note: "Now Mrs" [no name written]. Records show she married Elijah Milton Trumble. H. F. McKinney of Easton, Pennsylvania. Later note: "Now Mrs. Teoupese [not sure of surname]. S. Roselle Merwin, signed at East Windsor, Connecticut, on April 1, 1837. Later note: Mrs. ?, possibly Burroughs or Bennett or ? Nelson William Northrup, signed at Vernon, Connecticut, on September 18, 1835. H., followed by a string of numbers, signed at Vernon, Connecticut. Later note: "Now Mrs. Little". Perhaps Harriet Palmer who married William Buckingham Little. William G. Parsons, signed at Broad Brook, Connecticut, on March 12, 1839. Later note: "Dead, 1842". He was born in 1815 and died October 10, 1842. Mary, signed on April 27, 1835 at Vernon, Connecticut. Later note: "In 1836 was married to Mr. Wm. Merrick. And died March 1838 of consumption". Mary was presumably Mary Pearl, who married William Merrick at Vernon, Connecticut, on October 6, 1836. Louisa J. Porter of Vernon, Connecticut; album owner. Emily Ripley, signed at Coventry, Connecticut, on March 29, 1835. Later note: "Now Mrs. ?". It's possible to interpret the faint writing as Champlin, and there is in fact a record for the marriage of Mary Ripley of Coventry to William M. Champlin of Montville, Connecticut, in October 1835. H. S., signed at Stafford, Connecticut, on March 29, 1841. Later Note: "mith", added to the S., meaning the signer was H. Smith. Catharine W. Stiles of Willington, signed in November. Later note: "Mrs. Vinton". Connecticut Marriage record shows a marriage on June 6, 1843, at Willington, Connecticut, between Catharine W. Stiles and William M. Vinton. Facing pages sentiment by C. T. Talcott, signed at Vernon, Connecticut, on April 5, 1835; not sure of middle initial. Possibly Charles Trumbull Talcott (1809-1899), who married Jerusha Gager. W. H. Talcott, signed at Vernon, Connecticut, on September 20, 1835. S. A. W., signed at Vernon, Connecticut, in July 1838; not sure of middle initial. Jane Walker, signed at Vernon, Connecticut, on April 27, 1836. Later note: "Now Mrs. Perry". Presumably the Jane Walker who would marry Israel K. Perry in May 1837. Half of the page missing. Other half has sentiment of I. Wells or J. Wells; not sure of initial. G. Albert Whitney, signed at Vernon, Connecticut, in July 1838; not sure of first initial.